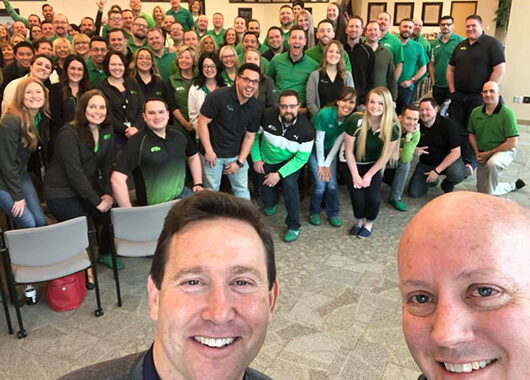 On April 4, several Idaho Central team members and members of the community had the opportunity to hear from Jon Gordon live at the Stephen’s Performing Arts Center in Pocatello, Idaho. Jon Gordon continued to engage with Idaho Central leaders the next day. As an influential thought leader, author, and presenter, he has inspired many businesses and nonprofits around the world. In commemoration of his presentation, we want to highlight a few ideas we seek to emulate at ICCU from Jon Gordon’s article 14 Thoughts About Building a Great Culture. #1. Great leaders build and drive great cultures. They know it’s their number one priority. They can’t delegate it. They must lead and be engaged in the process. #4. If you focus on the fruit of the tree (outcomes and numbers) and ignore the root (culture) your tree will die. But if you focus on and nourish the root you always have a great supply of fruit. #5. When building a team and organization you must shape your culture before it shapes you. A culture is forming whether you like it or not. The key is to identify what you want your culture and organization to stand for. Once you know the values and principles that you stand for, every decision is easy to make; including the people you recruit and hire. #7. Culture is dynamic, not static. Everyone in your organization creates your culture by what they think, say and do each day. Culture is lead from the top down but it comes to life from the bottom up. #10. When you build a strong, positive culture most of the energy vampires will leave by themselves because they don’t fit in. But you may also have to let a few energy vampires off the bus. We are often asked if you have to be happy to work at Idaho Central. What happens is that we hire positive people and the culture creates even more positivity in the workplace. Not only has ICCU been ranked nationally for financial performance, but we have earned a spot as one of the Best Places to Work in Idaho for five years in a row. We are grateful for our strong leadership that sets and establishes our values of Honesty and Integrity, Respect and Dignity, Growth and Performance, and Improvement and Accountability. We cultivate these values from the top down and bottom up. You can develop this culture wherever you work, and if you would like to learn more about life at ICCU you can contact our recruiting specialists or explore our careers at iccu.com.